Eli, dear brother, this is Paul West. I just wanted you to know that I am blessed by this review and regret that you and I have crossed theological swords in the past on SermonIndex. I see now that you were right all along, referring to grace, and I was wrong. God has opened my eyes in these last few years, and I am so grateful to Him. Ravenhill and Tozer's convictions have impacted me deeply in my early years as a believer, but they have led me to personal ruin rather than rest. Young believers really need to guard themselves with discretion and godly wisdom in what they allow into their minds through preachers and books. Just because there is zeal and passion, it doesn't always equate to truth. If a man is unclear on the simplicity of the gospel and the eternal grace of the blood of Christ, it matters not how eloquently he waxes on obedience, holiness, sanctification and repentance. Bless you dear brother! I can be reached at jalapablo@gmail.com. Eli, I hear and appreciate your review of Tozer's Knowledge of the Holy. I have gone back to this book many times for many years, largely for its devotional treatment of God and his nature. 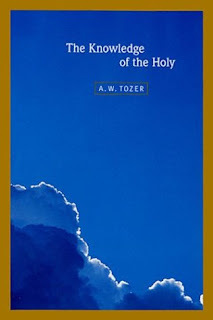 If you come at this book with a solid biblical understanding of God's sovereignty in Salvation, and of man's yeilding to the indwelling Spirit in sanctification, as He enables us to kill indwelling sin, then Tozer's errors can be seen, and to some degree tolerated. Balancing Tozer's treatment with many other good books on the attributes of God will do the same. As a committed Reformed Calvinist Covenantalist (! ), I have commended this book to many people BECAUSE of the devotional style, but doing as you have said, "Don't put the man on the pedastal and worship him!"